Location On the Strip, right on the Strip walk out onto the pavement next to Venitian and oppersite TI. Attractions None were noticed, but this is reckoned to have the most valuable Fun Book ( according to Las Vegas Advisor ). When getting our slot club cards the person in front asked for some playing cards, I did the same and got given a couple of decks of "used cards" from the casino. These are full sized, quality cards as opposed to the freebies given away like at the Tropicana slot club. Oh and very cheap beer and free smoke, unforunatly all second hand yuk ! Shows and Entertainment Erm nope uless you count watching drunk folk act stupid. Dining I saw no restaurants though apparently there are two upstairs, I was never aware that there even was an upstairs. Attached to the casino is a very busy Denny's selling a variety of good quality, cheap food. Gaming A mere 6000 sq. ft of gaming space with about 500 machines, 11 tables and a roulette wheel squeezed in. This is a dark crowded casino aimed at the lower spending tourist market. 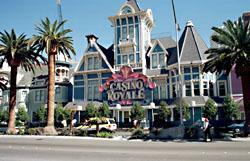 Casino Royale has a large percentage of nickel machines and even has a few penny machines, the only casino on the strip to offer gaming at this low stake. It can be smoky unless you sit near the doors, which unlike most other Strip casinos are usually left open. You do get low limit tables here 24/7. Drinks service We did not stay long enough to be served cocktails but looking at other patrons and the states of soberness that they were in I guess the service must have been pretty good. However you dont really need it as the bars are so cheap. Overall A small low rollers casino if this casino were in England it could only be at Blackpool, Brighton or Southend. Good points Erm low limit tables its so close to the Strip you can get out quick ! Bad points Smoke, clintele did I say smoke and clintele ?